Earlier this week, a storm spawned by the former Cyclone Gita swept across New Zealand, damaging buildings, knocking out electricity, and creating floods. 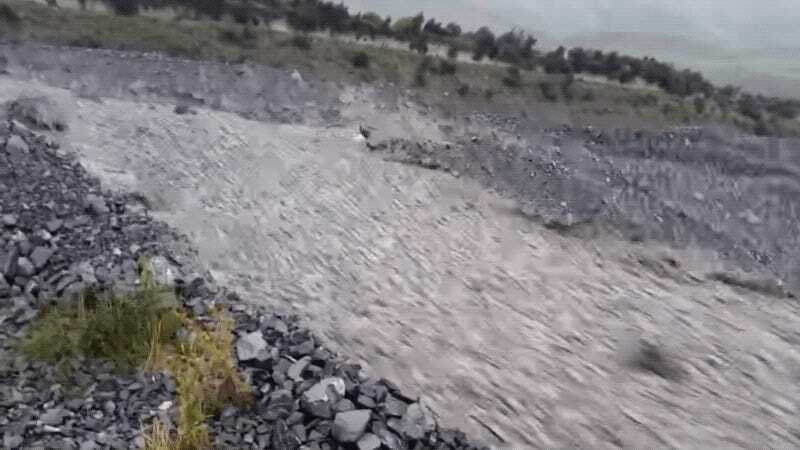 But along the Rakaia River, the storm triggered a bizarre natural phenomenon known as granular flow—essentially a raging river of rocks. This is a magnificent example of a granular flow. Whilst they appear to be very exotic, granular flows are quite common and have been well-described in the literature. In essence the pebbles behave as particles, allowing behaviour that is akin to that of a fluid. Of course the density of the fluid is somewhat higher than that of a more familiar liquid, such as water, and the particles are many times larger, but the river of rock is still able to generate the sorts of flow structures that we see in water...I suspect that this one comprises particles that are of a comparatively even size—Simon Cox from GNS suggested to me that the material is probably greywacke. It may be that this uniformity lies behind the unusual characteristics of this flow. Greywacke is a dark, coarse chunk of sandstone with some clay inside it, for those of you not familiar with the term [raises hand]. New Zealand is particularly prone to erosion, making the island country susceptible to this sort of natural phenomenon. Needless to say, if you ever see such a spectacle, avoid the temptation to jump in for a ride. You will most assuredly die a quick, miserable death.